The Saint Benedict Medal is a Christian sacramental medal containing symbols and text related to the life of Saint Benedict of Nursia, used by Roman Catholics, as well as Anglicans, Lutherans, Methodists and the Western Orthodox, in the Benedictine Christian tradition. The medal is one of the oldest and most honored medals used by Christians and due to the belief in its power against evil is also known as the "devil-chasing medal". As early as the 11th century, it may have initially had the form of Saint Benedict's cross, and was used by Pope Leo IX. In widespread use after its formal approval by Pope Benedict XIV in the 18th century, the medal is used by Roman Catholics to ward off spiritual and physical dangers, especially those related to evil, poison, and temptation. 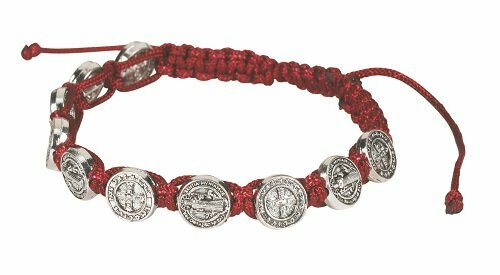 This popular bracelet comes with 10 alternating St. Benedict medals strung on a durable nylon cord. Each bracelet is adjustable so it can be sized and worn by just about anyone.